This new book by Tristram Hunt - Building Jerusalem: The Rise and Fall of Victorian Cities [Amazon | book site] - is getting a nice amount of attention in the press. It's a subject close to my heart in my work, and as a former resident of Manchester and Sheffield. The Guardian has a précis of his lecture at the Hay-On-Wye literary festival. "The life chances of a slum dweller in early Victorian Glasgow or Liverpool were the lowest since the Black Death (but) the cities also forced through religious tolerance, a wider franchise, and repeal of the corn laws. Gradually their nonconformist business elites improved public health and evolved traditions of voluntary activity, local pride and artistic patronage. The amazing Victorian Gothic of Manchester town hall and magnificent buildings elsewhere celebrated a modern renaissance city state. Later, cities also bred the spirit of municipal socialism, which ran gas, water and electricity more cheaply than private companies, Dr Hunt said. But in the 20th century, state uniformity, instead of civic strength, became the vogue. State authoritarianism undermined civic initiative. Two Tory prime ministers, Edward Heath and Margaret Thatcher, vandalised city councils with rationalisations and privatisations. Quangos hijacked democratic provision of services. "Architects and planners decided to finish off those parts of the Victorian civic fabric which the Luftwaffe had missed. "By the mid-1990s, local government expenditure counted for under a quarter of total government expenditure while over threequarters of council funds were controlled by Whitehall," Dr Hunt said. The challenge is to find new methods of generating pride. What successful modern cities have also appreciated is the extraordinary civic architecture of the Victorian city. They have turned warehouses into penthouse flats, royal exchanges into restaurants, and chapels into community centres. It is this re-appropriation, this re-engagement with the Victorian urban past which allows us finally to shed the shadow of [Victorian slums]." As I type this, a block away from my flat, under the austere and glowering gaze of the mighty Senate House, they're filming the new Batman movie (called Batman Begins, aka The Intimidation Game, which was what was actually written on the papers stuck on the windscreens of the crew's numerous trucks). I didn't see any of the glittering cast (dir. Christopher Nolan, Christian Bale, Michael Caine, Gary Oldman, Katie Holmes, Morgan Freeman, Rutger Hauer etc.) though I did see plenty of replica US police cars with Gotham Police Department insignia on the side. Rather incongruous in genteel Bloomsbury, I can tell you. I got stopped from taking any proper photos, so only managed to sneak off this quick Nokia-cam one indicating the production staff trying to film without closing the streets down. According to a decent post by Kris Tapley half-way down this otherwise chaff-heavy thread at an IMDB messageboard, Nolan is a big fan of Blade Runner's non-CGI effects - hence the importance of period architecture presumably. I think he's picked a good 'un - Senate House would seem to be a perfect stand-in for a faux-'30s monolithic US police department building. 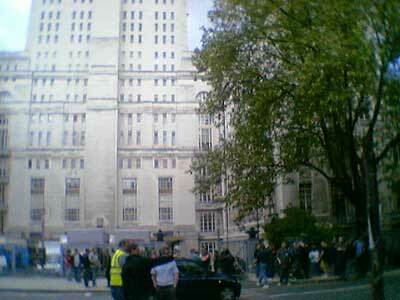 Senate House's mythology is already greater than that conjured by its awesome physical presence, reputed to be the model for Orwell's Ministry of Truth in his 1984 (as noted previously) - and it's frequently a host for scurrying film crews, though I haven't spotted it in a film or TV thus far. And so now it appears to be part of a Raymond Hood-inspired alternative New York too (as 'Gotham City'). Simulacrum indeed. It's interesting to ponder that a chunk of London's fabric gets used to conjure this exaggerated unreal New York - somehow London becomes another chapter in New York's Celluloid Skyline. A few years back, Sheffield chanced its lottery-strengthened arm by building a National Museum for Popular Music. A fabulist building by Nigel Coates and Sheffield's heritage of Cabaret Voltaire, Heaven 17, Human League, ABC, and Pulp notwithstanding, the project failed miserably. When I visited my old hometown a month or so ago the building lay largely empty, its steel drums brooding within the otherwise vibrant cultural industries quarter, only seemingly used as an overflow from the nearby student union. "The museum will mark the city's place as a classical music mecca in the 1860s, show off relics from its 250 1960s beat clubs (more than any other city in the world, including Liverpool), its thriving 1940s jazz scene and - perhaps the finest of all - the Madchester days of the Happy Mondays, New Order and Factory Records." The excellent Mixmatcher has relaunched. I first blogged about this ages ago (and several times since), but a new version has been in development for a long time, with Ben Tesch rebuilding from scratch - but no longer. I've various peeks at it, at the invite of Ben, while it was under wraps and he's really built in some smart new features - XML feeds, Friendster-style action, song ranking, links to iTMS etc. Here's an example list with lots of potential: Really good covers you think no one else has heard. Check it out. Yes, "A Nightingale Sang In Berkely Square" ... but as loudly as a chainsaw?! "Urban noise can force nightingales to sing so loudly that they break European sound pollution regulations, new research has discovered ... "The loudest I recorded was 95 decibels ... That's as loud as a chainsaw one metre away, or a large truck." ... A spokesman from the UK's Royal Society for the Protection of Birds does not think the nightingales' increased efforts is a cause for concern. He says it would be more worrying if the birds were unable to make themselves heard above the din of the city." "Pac-Manhattan is a large-scale urban game that utilizes the New York City grid to recreate the 1980's video game sensation Pac-Man. This analog version of Pac-man is being developed in NYU's Interactive Telecommunications graduate program, in order to explore what happens when games are removed from their "little world" of tabletops, televisions and computers and placed in the larger "real world" of street corners, and cities. A player dressed as Pac-man will run around the Washington square park area of Manhattan while attempting to collect all of the virtual "dots" that run the length of the streets. Four players dressed as the ghosts Inky, Blinky, Pinky and Clyde will attempt to catch Pac-man before all of the dots are collected. Using cell-phone contact, Wi-Fi internet connections, and custom software designed by the Pac-Manhattan team, Pac-man and the ghosts will be tracked from a central location and their progress will be broadcast over the internet for viewers from around the world." Though I signed up over a year ago, it's only in the last month of so that I've begun to really use the fantastic Audioscrobbler. Basically, a discrete plugin which keeps track of what music you're playing (in iTunes, WinAmp, WMA9, XMMS &c) and then aggregates that on a personal page at audioscrobbler.com (here's mine). I think it uses Musicbrainz - the 'community music metadatabase' - as a 'back-end', such that clicking on a song will fairly accurately show who else is a fan of that song. As Phil Gyford notes, this comparison ability is darn good for discovery. The author, Richard Jones, is now adding some social software-like features: friends, groups etc. It's very cool. Of course, you could use this notion of 'friends' as part of a music recommendations system, as I mentioned recently, in addition to the aggregation of broad patterns via collaborative filtering. A potential limitation with Audioscrobbler's implementation of friends at the moment is that it wouldn't enable me distinguish a friend whose musical taste I trust (and would want my recommendations to be more weighted by) from a friend whose musical taste I either don't trust or just don't want to affect my recommendation. With some of these minor modifications, a more complex recommendation model is within reach though, built around combining collaborative filtering with a way of weighting the scores from 'friends with similar or interesting tastes'. With music (and perhaps other similar cultural fields), in any given social group (whether <5, <50, or <150), there's always those whose job it is to make the mixtapes, to DJ at parties, to share their playlists, who others turn to for music recommendations. Combine that complex local knowledge with the blunter tool of 'the math' (as Lucas Gonze notes in the comments at Many2Many) by passing collaborative filtering over these enormous aggregations of data from systems like these, and we could be on to something. It's got to the stage where I'm actually slightly disappointed to think that all the listening I do out on the street or cafe with my iPod isn't being recorded by Audioscrobbler. So it's only a part-presentation of self - only part of me is being recorded/transmitted here - my listening at home. Actually, here's the opportunity for Apple. Obviously, across their connected music infrastructure of iPod, iTunes, and iTMS they're tracking all those play counts too. iTunes could do everything 'Scrobbler's currently doing - the networks, the artist lists, the groups, the friends. You could have your personal page at Apple (or rather, within iTunes), keeping a track of your most-listened to artists/tracks - and then publish it within that infrastructure. Then simply extend that with some relatively straightforward features to enable adding friends and localised groups. Again, add some indication of how much you want particular friend's listening habits to affect your recommendations (i.e. 'let David affect my recommendations this much; Matt this much etc.) Then mix up with the massive collaborative filtering potential based around a distributed world of listeners ('spyware' issues perhaps, ones that Audioscrobbler neatly sidesteps). Moreover, Apple have a post-browser application which could handle presence too (via integration with iChat) - akin to what iChatStatus already does, but within iTunes - people listening to the same track right now; your friends and what they're listening to etc. So, there are huge opportunities for Apple ahead, if they want to go that way. Though what 'Scrobbler does of course is accept, aggregate, and publish all that detail cross-platform, from multiple plug-ins/media players, and then make that super-accessible over http/html - which is very smart (and yet, it does hamper it when it comes to denoting presence, and browser-based solutions just can't match the kind of quick music browsing/searching that iTunes/iTMS was built for, due to its post-browser incarnation). But this post started about features available right now, and within Audioscrobbler. In fact, it's currently something of a victim of its own success, creaking under the strain a bit, so I'm somewhat loathe to point more people at it. However, part of the reason I'm writing is to suggest people donate to Audioscrobbler!. They need another fast database server, and I reckon that's a good cause. Paypal etc will do it. Whatever Apple do with iTunes, Audioscrobbler is out there breaking new ground right here, right now. Please donate to Audioscrobbler today!